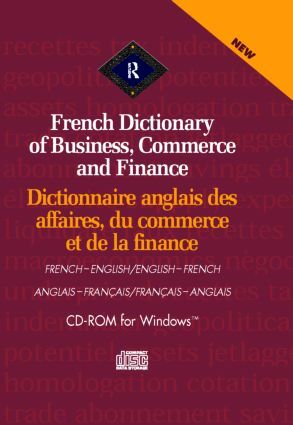 This dictionary consists of some 100,000 terms and references in bith French and English, including 4,000 abbreviations. over 45 subject areas are covered, including: * Accountancy * Banking * Business Administration * Computing * Economics * Environment * Finance * General Commerce * Human Resource Management * Import/Export * Industry * Insurance * Law * Leisure * Management * Mathematics * Media * Patents * Politics * Property * Sales & Marketing * Stock Market * Taxation * Tourism * Transport * Welfare & Safety. Also included is a comprehensive up-to-date reference section on countries, business correspondence and situations, job titles, stock exchanges, economic indexes and numbers. Term Specialists - the terms list has been checked by over 100 sources including experts from Apple France * Association Française des Banques * Chartered Institute of Banking * France Telecom * Institute of European Trade and Technology * American Graduate School of Management * London School of Economics * Ecole supérieure de commerce de Lyon * Department of Trade and Industry * Law Society * University of Reading * Environment Council * University of Bath * Centre de Recherche et de Gestion * Manchester Business School * Ecole supérieure internationale de commerce and Ecole des hautes études commerciales de Montrial(HEC). Prestigous experts - include Prof. Chris Nobes, Prof. Michel Péron, Prof. Gordon Shenton, Dr. Van de Yeught and Prof. Peter Walton. Native Speakers - all stages of compilation have included native speakers of French as well as English and extensive coverage of US as well as UK terminology.